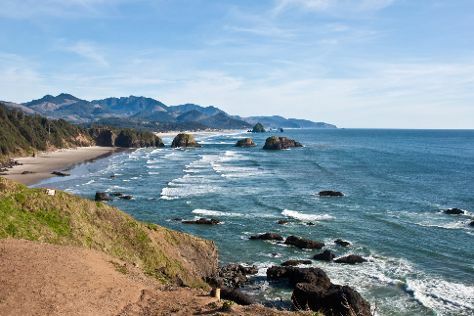 Saved from the pitfalls of modern urban development by government decisions made in the 1910s, the Oregon coast remains one of the country's most picturesque natural places to visit, featuring more than 80 state parks. Tourism from around the world thrives here all year long, with visitors eager to drive up and down this scenic stretch of the Pacific coastline, marked by rocky headlands and lush vegetation. Crossed by rivers and dotted with dense forests, the area offers nature lovers a chance to boat, fish, hike, and whale-watch. Start your Oregon vacation by exploring the northern end of the coastline, famous for its vibrant beach resorts and quaint seaside retreats. Oregon Coast is in Oregon (OR). Take a peek at our international travel planner: Oregon Coast and its charms laid bare and easily scheduled.